To Cite: Fathi Vajargah K, Darvand S. Assessing and Evaluating the Effect of Information and Communication Technology on Improving Teaching and Learning Levels among Secondary School Students: A Case of Razi Vocational School in Marivan, Interdiscip J Virtual Learn Med Sci. 2018 ; 9(1):e65358. doi: 10.5812/ijvlms.65358. Background: Nowadays, the ability of information and communication technology (ICT) in removing teaching and learning difficulties has caused ICT to be the core of most educational systems. This research aimed to study the ICT effect on improving teaching and learning levels of male students of the vocational school of Razi in Marivan from the student’s points of view. Methods: This research was a practical and descriptive-analytic study in terms of information gathering and of semi-experimental pre- and post-test type with a control group, which was conducted in 2014. The statistical population included all students in Razi vocational school of Marivan. Two classes were chosen randomly as the experimental group (n = 38) and two as the control group (n = 45). A questionnaire was designed with 34 questions and administrated to the sample members. The questionnaire’s validity was confirmed by 6 specialists who were experienced in a similar research area and the reliability was calculated using Cranach’s alpha (α = 0.81). The data were analyzed by SPSS version 16 software using descriptive statistics indicators (mean), inferential statistics tests (one sample t-test, the chi-2 test of homogeneity, Pearson, and Spearman correlation coefficients), and covariance analysis. Results: The results of one sample t-test with the standard mean (3) indicated that there was a significant difference in all components (learning and teaching levels) between the obtained mean and the standard mean. The obtained mean was higher than the standard mean in all components (P < 0.01, P < 0.05). Conclusions: The findings showed that as students familiarity with ICT increases, their teaching and learning levels improvement rate enhances (educational success) because of using ICT tools in the process of teaching. Thus, to provide students with a more effective education and assuring their educational success, it will be beneficial for Razi vocational school teachers to use ICT-based education in their educational practices. The evolution of information and communication technology in the field of education has provided a strong and very practical tool to authorities, experts, and educational planners in order to change and improve teaching and learning methods, giving excellence to educational goals, educational reform, and adaption to current changing and complex conditions. The main goal of applying ICT is to facilitate, expand, and reinforce the teaching and learning process (1). The entrance of information and communication technology has converted learning and teaching environments from a traditional and closed environment to an open, exchanging, and interacting one (2). Through applying ICT, a lot of far-fetched dreams have been realized and many difficulties such as functionalization of training, focusing on learners abilities and needs, the institutionalization of student-based education, changing teachers role as a guide, and eventually authenticating lifelong education have been solved (1, 3). Technology application in education includes any kind of informative tools that may be used in education and training (4). Among these, information and communication technology is a set of service tools and activities including internet, remote services and supplies, information technology equipment, radio and press, business information providers, information services on networks, and similar items (5). Although visual images for learning have been used since a long time ago, learning based on technology by using audio and video tools dates back to the US schools in 1900, and following the second world war, ICT development and utilization have widened (6). Nowadays, ICT has gained a significant development in a way that information and communication technology embodies the heart and the core of world’s most educational systems as the great component of the modern world (7). It is inevitable to the country’s education department to use technology in the process of teaching in order to maintain and upgrade its position in students’ education and training and upgrading teachers’ knowledge level (8, 9). The information and communication technology can be defined as a combination of computer, video and remote technologies such as using multimedia computers, networks, and other services depending on them (10). Certainly, future education and training will be based on creativity, wisdom, and strength and this important matter will not be possible unless by changing traditional training methods to new training ones through information and communication technology (11). Applying ICT will remove educational injustices and will eventuate in a desirable access to training for everyone. Merging information and communication technology in the curriculum in order to reinforce learning and managing it enables teachers to understand how their teaching manner and students’ learning change (12). Teachers even are able to consider students’ individual differences and perform the training proportionate to the students’ abilities and differences (3, 13). Active learning components in Banool and Ison’s point of view, as well as the role of active teaching, and learning are mentioned in Table 1. It can be concluded from the table that information and communication technology plays an effective role in the realization of active learning. The researchers that have studied the impact of ICT in learning environments will be mentioned in the following. Xiao conducted a research on “The role of information technology in learning" stating that utilization of information and communication technology even in a short period can perform as a suitable tool to modify and upgrade the quality of learning (15). Another research project with the title of ACOT has been conducted in order to design schools essential principles in 21 century. That study focused on the relationship of teacher-student and the curriculum by the cooperation of schools, universities, and researchers from 1985 to 1995. This program has presented effective models and methods for learning and teaching through technology; in addition, it showed that technology as a new and effective tool of learning has been introduced by teachers in classes and traditional methods have been replaced by the active and student-centered methods (15). Harison et al. conducted a research on using ICT in England’s school classrooms; the results showed that ICT had a positive influence on motivation, confidence, social skills, group, and participatory skills and increased their scientific performance (16). Kikha and Hoveida conducted a study among middle school students of Zahedan province on the subject of” the influence of information and communication technology on middle school students’ learning” using a descriptive-survey method. The research findings showed that ICT owns a positive influence on increasing students’ perseverance, creativity, and educational success (17). Fathi Vajargah and Saadat Talab performed a study entitled “feasibility study of using ICT in Iranian secondary schools”. This was a mixed method research study (using both qualitative and quantitative methods) and due to the nature of the research, data collection included two stages: library and field study. The results demonstrated that teachers agreed with the types and features of ICT. In addition, they believed that the status of resources, facilities, and conditions for implementing ICT in schools are insufficient. The teachers confirmed the facilitating factors of ICT applications in secondary schools (18). Sattari et al. in a survey entitled "the relationship between using information and communication technology and high school students’ success” studied the ICT influences in Pars Abad’s schools from the teachers’ points of view. The results showed that there was a significant relationship between using ICT and educational success components including increasing creative thinking, a tendency towards class and task performance, and students’ discipline (19). Salehi et al. conducted a research entitled "the influence of information and communication technology on Fasa’s high-school teachers’ creativity and effectiveness”. The results demonstrated there was a significant difference between creativity and innovation of teachers who used information and communication technology and those who did not (20). Morino et al. emphasized the importance of ICT influence in providing expert workforce and considered it necessary for society’s economic development (Figure 1) (21). Figure 1. 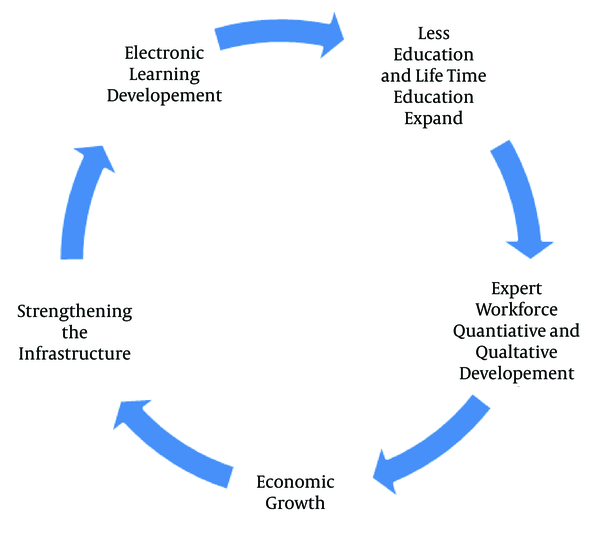 The Impact of Workforce Learning Based on ICT Diagram. It is worthy to mention that the role of ICT in the higher education system has been investigated by some researchers. Fathi Vajargah et al. conducted a research entitled “application of ICTs in teaching and learning at university level”. This research was conducted at the National University of Iran. The research population consisted of the university academics and students. A questionnaire was administrated for collecting the data. The results of the study showed that there were several challenges pertaining to ICT application in Iran such as lack of National Policy in terms of using ICT in Higher Education, lack of adequate investments, cultural obstacles, financial challenges, lack of continuity in ICT use, and lack of systematic training and development programs (22). 1. What influences did ICT exert on vocational school students’ learning? 2. Is there a significant relationship between the rate of students’ learning and teaching status changes and individual indicators such as the average and rate of student’s familiarity with ICT representatives? This study is an applied research in terms of purpose, and with respect to information gathering, it is a descriptive-analytic study of semi-experimental pre- and post-test type with a control group. The methodology of this study is documentary in the theoretical section and survey in the practical one. In the documental method, the information was gathered from books, research papers, and national and international conference proceedings and required information was collected via questionnaires for the field method. The statistical population included all students in the Razi vocational school in Marivan. There were 11 classes for different majors at this high school. Four of these classes were supplied with ICT equipment. Therefore, two of them were chosen randomly by drawing as the experimental group (38 people), and the other two classes which lacked ICT equipment were chosen as the control group (45 people) in the same way. A similar pretest was conducted for both groups which included main indicators of improving teaching and learning level and they were asked to present their opinions regarding the test questions. An oral agreement was developed with examinees so that they could leave the research if they wanted. All of their information would have remained confidential. Since the classes had the same teachers, they were asked to teach the same subjects to both experimental and control groups; of course, the control group with traditional method and the other group with ICT means. After eight weeks of teaching various subjects, a similar test was conducted including educational success indicators through the improvement of teaching and learning levels as a re-examination of both groups, which was considered as the posttest. It should be noted that in a meeting with the relevant teachers, some arrangements were done in terms of applied ICT equipment (PowerPoint, educational videos, images, and Internet connection) and how to use them. In addition, during the research and sessions, teachers’ classes were visited via direct observation in order to provide a desirable analysis of the current situation. The pre and posttest designed questionnaires consisted of 34 questions in the form of a Likert scale (1-very low/ 2-low/ 3-average/ 4-high/ 5-very high) and they were derived from the indicators presented in Box 1. The questionnaire validity was confirmed by 6 experts who had conducted similar studies (faculty of educational sciences, Kurdistan University, 2 Ph.Ds. in educational management, 3 Ph.Ds. in curriculum planning, 1 Ph.D. in Philosophy of Education) and the reliability was confirmed according to the Cronbach’s alpha coefficient, which was 74 in the pretest and 81 in the posttest, indicating the inherent correlation between the responses. Covariance analysis, one sample T-test, Mann-Whitney U test, and Chi-square and Pearson and Spearman correlation coefficients were used for data analysis. A total of 83 respondents in both experimental and control groups were male and were in the range of 14 to 17. In order to learn about the students’ teaching and learning status, it is looked at the descriptive statistics of pre- and post-test in the two groups in Table 2. As can be seen in the pre-test, there was no much difference between the two groups scores; but, there was a difference in the post-test. The covariance analysis was used to determine ICT influence on students’ educational success and improving their teaching and learning level that explains a part of the first question of the study. By looking at the fourth line of the main output of the covariance test, which is presented in Table 3, it can be concluded that considering that the calculated probability is smaller than the alpha level of 0.05. (P = 0.03), students learning, learning and academic success of knowledge are meaningful in the two groups, and ICT has been effective in improving those students’ teaching and learning level who used ICT equipment during the research. In addition, for a more accurate analysis of the impact of ICT on the measured indicators of improving teaching and learning status and academic achievement of students (in the experimental group), one-sample T test was used. The results presented in Table 4 show that in all indicators, the calculated means are more than the numerical desirability of the test (3). In addition, the calculated levels of significance were lower than the alpha level of 0.05; thus, it can be said that ICT application has been effective in improving these indicators according to student’s viewpoints. In total, the calculated average of 3.60 for the status of all the indicators, the positivity of both upper and lower limits, the lower calculated significance level than the alpha level of 0.05, and the desirable statistical t value confirm this issue. aValue of numerical desirability of test case – 3.
bThe difference from the numerical desirability. According to Table 4, the results of one-sample T test with an average score of 3, at 0.05 and 0.01 error levels showed that there was a significant difference between the obtained mean and the standard mean in all components of teaching and learning. In all components, the gained average was higher than the standard average. Therefore, the zero assumption was rejected and the assumption raised by the researcher that the information and communication technology has an impact on improving the level of teaching and learning of high school students was confirmed. There was a relationship between the improvement of teaching and learning level (academic success) and the familiarity of students in the two classes (experimental group) and the direction of that relationship was confirmed to be positive, so it can be said that the higher students’ acquaintance with ICT appearance, the higher their level of improvement in teaching and learning levels (academic success) through using ICT tools in the teaching process (Table 5). Next, the correlation relationship analysis between the students’ teaching and learning level (educational success) through applied ICT equipment during their classes and their averages in the two groups will be discussed. The students’ averages based on improving teaching and learning levels were placed at 3 levels of low, medium, and high, and based on the values were placed in 3 levels of high (17.1 - 20), medium (14.1 - 17), and low (10 - 14), which given the calculated significance level (0.24) that is lower than the alpha 0.05 level. There was a significant relationship between these two variables with a positive and direct trend with Pearson correlation coefficient equal to 0.502. Thus, it can be demonstrated that those students with higher averages following exploiting ICT equipment during their classes gained improved learning and teaching with more educational success. Information and communication technology provides a variety of teaching and learning methods, improving problem-solving capacity, and reinforcing creative and critical thinking and conceptual learning among students. In this regard, the purpose of this study was to assess the impact of using ICT equipment during the teaching and learning process among high school students. The results of data analysis in the two control and experimental groups showed that in the present study, as in the research of Roschelle et al. (23), Kiguli-Malwadde et al. (24), Gormally et al. (5), and Hsu (25), ICT was able to improve the performance of students’ teaching and learning indicators. Studying the average responses provided by the students indicated that there was no significant difference between the two groups in the pre-test, though in the post-test, the mean difference between the two groups was significantly meaningful, so that the experimental group with a tangible increase in average compared to pre-test gained the favorable score of 3.60, and control group with a decrease in average compared to pre-test gained an unfavorable score of 2.88. In addition, the study of the measured indices in the experimental group with a one-sample T test illustrated that the calculated averages were in a satisfactory status for all indicators that were evaluated so that it can be claimed with a 0.95 percent certainty that their improvement was due to the applied ICT equipment. Align with this conclusion, Thomson’s report of three thousand schools in the United States as to the students view about ICT and education demonstrated, according to the students’ common view, ICT should fully participate in education (20). Meanwhile, the satisfaction with the new teaching status indicators, increasing teachers teaching motivation, students’ engagement in the classroom, learning out-of-the-book, and remembering their contents were calculated to be the highest averages. It indicated applied ICT equipment converted classrooms’ atmosphere to be dynamic. Based on an interactive relationship between the teacher and students that provides the background for expressing more material from the teachers and makes students understand them via ICT equipment, it increased students’ remembrance and maintaining the material in their minds as well as their satisfaction with the new teaching method. Although some teachers described applied ICT equipment during the teaching process as a disorder-enhancing factor, students also assessed the average discipline in the class with a mean of 3.16 in comparison with other indicators. In order to overcome this problem, As Xiwu’s research showed, students could be placed into groups to engage more in the process of learning. Moreover, they could be asked to present a matter in relation to the subject and raise questions to the rest of the students (14). The comparison of students’ viewpoints in the two examined classes indicated that there was a significant difference at 0.05 significance level with 0.95 certainties. In the following, the two indicators of students’ familiarity rate with ICT equipment and their average values are used to specify this level of difference. Accordingly, the obtained results of chi-2 agreement table indicated for students familiarity indicator at three levels of high, medium, and low, those students with further familiarity with ICT equipment possessed a higher average of 3.81 compared to those with a medium familiarity with the average rate of 3.11, and those of medium familiarity level with ICT equipment gained an unfavorable average of 0.90, with a better learning and teaching level compared to those with no familiarity with ICT equipment. Finally, we can assert at 0.95 certainty level that with a positive and direct trend, as the students’ familiarity with ICT equipment increases, their learning and teaching level and consequently their educational success enhance. The results are consistent with the results of Stearns et al. (18). In this study, as students’ familiarity and ability to engage with ICT equipment increased, their educational success enhanced proportionately. It is suggested that to exploit the effective use of ICT, some courses are held for the teachers along with their service. To maximize the capacity of ICT, the inclusion of ICT skills, ICDL, and the Internet in academic books is recommended. In addition, technology educators and designers are needed to design and produce appropriate electronic and multimedia courses for each course unit. Another part of the research findings regarding the reasons for explaining the significant difference in improving the level of teaching and learning of students showed that the average score also had a positive and direct relationship with this index in a way that students with higher average were more likely to use ICTs than other students were. In addition, the level of teaching and learning improved and progressed. Here, students with lower grades are required to focus more and become more familiar with ICTs and its applications so that they can take advantage of the positive effects of ICTs in learning and educational success. Moreover, incorporating these students with those with higher averages, making them familiar with ICT methods, and enabling them to perform group work in the class will be an effective approach. The restricted statistical population to males in this study and risk of generalizing the results to females and the restricted statistical population to the vocational schools of Marivan and risk of generalizing the findings to other parts of the country are limitations of the current study. Authors’ Contribution: Developing the original idea, setting the research question, and findings presentation: Soran Darvand; reviewing the literature in a systematic way, searching and selecting appropriate texts, data extraction from the text: Soran Darvand and Kourosh Fathi Vajargah; quality evaluation of the selected studies and systematic literature reviews: Kourosh Fathi Vajargah; analysis and combining the qualitative findings, validity and reliability control: Soran Darvand. 1. Teichner F. The Role of Information and Communication Technology in Education. Prosiding Konvensyen Teknologi Pendidikan ke. 2005;18:16th-9th. 2. Montrieux H, Vanderlinde R, Schellens T, De Marez L. Teaching and Learning with Mobile Technology: A Qualitative Explorative Study about the Introduction of Tablet Devices in Secondary Education. PLoS One. 2015;10(12). e0144008. doi: 10.1371/journal.pone.0144008. [PubMed: 26641454]. 3. Hanley GL. e-Learning and the Science of Instruction. Appl Cogn Psychol. 2004;18(1):123-4. doi: 10.1002/acp.969. 4. Baylor AL, Ritchie D. What factors facilitate teacher skill, teacher morale, and perceived student learning in technology-using classrooms?. Comput Educ. 2002;39(4):395-414. doi: 10.1016/s0360-1315(02)00075-1. 5. Gormally C, Evans M, Brickman P. Feedback about Teaching in Higher Ed: Neglected Opportunities to Promote Change. Cell Biol Educ. 2014;13(2):187-99. doi: 10.1187/cbe.13-12-0235. 6. Dori YJ, Belcher J. How Does Technology-Enabled Active Learning Affect Undergraduate Students' Understanding of Electromagnetism Concepts?. J Learn Sci. 2005;14(2):243-79. doi: 10.1207/s15327809jls1402_3. 7. Livingstone S. Critical reflections on the benefits of ICT in education. Oxford Rev Educ. 2012;38(1):9-24. doi: 10.1080/03054985.2011.577938. 8. Park SH, Ertmer PA. Examining barriers in technology-enhanced problem-based learning: Using a performance support systems approach. Br J Educ Technol. 2008;39(4):631-43. doi: 10.1111/j.1467-8535.2008.00858.x. 9. Albirini A. Teachers’ attitudes toward information and communication technologies: the case of Syrian EFL teachers. Comput Educ. 2006;47(4):373-98. doi: 10.1016/j.compedu.2004.10.013. 10. Kozma RB. Comparative Analysis of Policies for ICT in Education. Springer; 2008. doi: 10.1007/978-0-387-73315-9_68. 11. Khanipoor F, Amini M, Bazrafcan L. Evaluation of educational program in the Master of Medical Education by Eisner's educational connoisseurship and criticism model. J Educ Health Promot. 2017;6:55. doi: 10.4103/jehp.jehp_103_15. [PubMed: 28616422]. 12. Li Q, Ma X. A Meta-analysis of the Effects of Computer Technology on School Students’ Mathematics Learning. Educ Psychol Rev. 2010;22(3):215-43. doi: 10.1007/s10648-010-9125-8. 13. Angeli C, Valanides N. Preservice elementary teachers as information and communication technology designers: an instructional systems design model based on an expanded view of pedagogical content knowledge. J Comput Assist Learn. 2005;21(4):292-302. doi: 10.1111/j.1365-2729.2005.00135.x. 14. Garrison DR. E-learning in the 21st century: A framework for research and practice. Taylor & Francis; 2011. 15. Chan RV, Patel SN, Ryan MC, Jonas KE, Ostmo S, Port AD, et al. The Global Education Network for Retinopathy of Prematurity (Gen-Rop): Development, Implementation, and Evaluation of A Novel Tele-Education System (An American Ophthalmological Society Thesis). Trans Am Ophthalmol Soc. 2015;113:T2. [PubMed: 26538772]. 16. Harrison C, Comber C, Fisher T, Haw K, Lewin C, Lunzer E, et al. ImpaCT2: The impact of information and communication technologies on pupil learning and attainment. British Educational Communications and Technology Agency (BECTA); 2002. 17. Ajami S, Arab-Chadegani R. The effects of applying information technology on job empowerment dimensions. J Educ Health Promot. 2014;3:84. doi: 10.4103/2277-9531.139250. [PubMed: 25250350]. 18. Fathi Vajargah K, Saadattlab A. A feasibility study of using ict in Iranian secondary schools: The case of Tehran province. Turk Online J Educ Technol. 2014;13(3). 19. Boyce EG, Lawson LA. Preprofessional Curriculum in Preparation for Doctor of Pharmacy Educational Programs. Am J Pharm Educ. 2009;73(8):155. doi: 10.5688/aj7308155. 20. Salehi M, Gholtash A, Azadmehr A. Effect of Information and Communication Technology on Effectiveness and Creativity of High School Teachers of Fasa. 2011. 21. Thomson S, De Bortoli L. PISA 2003 Australia: ICT use and familiarity at school and home. OECD Programme for International Student Assessment (PISA); 2007. 22. Fathi Vajargah K, Jahani S, Azadmanesh N. Application of ICTS in teaching and learning at university level: The case of shahid beheshti university. Turk Online J Educ Technol. 2010;9(2). 23. Roschelle JM, Pea RD, Hoadley CM, Gordin DN, Means BM. Changing How and What Children Learn in School with Computer-Based Technologies. Future Children. 2000;10(2):76. doi: 10.2307/1602690. 24. Kiguli-Malwadde E, Talib ZM, Wohltjen H, Connors SC, Gandari J, Banda SS, et al. Medical education departments: a study of four medical schools in Sub-Saharan Africa. BMC MedEduc. 2015;15(1). doi: 10.1186/s12909-015-0398-y. 25. Hsu J. Innovative Technologies for Education and Learning. IGI Global; 2009. doi: 10.4018/978-1-87828-991-9.ch084.